February 2, 2012 By Tiffany 5 Comments By clicking on our links, we might make a SMALL commission - Thanks for the support! See our full DISCLOSURE here. Last night I attempted this chicken recipe HERE. It was really good, but if you have to buy the puff sheets they are pricy, like $5 a package. One package only does 2 chicken breasts. Thankfully, I had some I had gotten on clearance with coupons in the freezer. This week is our last before sports start…. taking a deep breath and bracing myself! we have 6 of the 7 kids playing ball. As crazy as it gets, I love every second of it. We love to be outside and I love the little kids playing in the dirt at the ballfields! 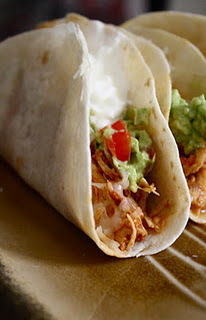 Monday – Crock Pot chicken soft tacos from Chocolate Therapy. I have left over raw chicken from last night and this will be easy to toss in right now. I have a bunch of errands to run and have everything in the fridge for this! 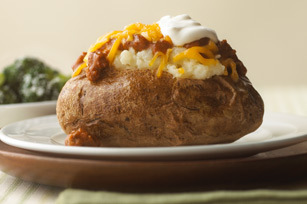 Tuesday – Chili Baked Potato. Last week I suggested using the Hormel coupons and getting some really cheap chili. There are coupons for everything in this meal and potatoes are cheap. Did you know you can “bake” potatoes in a crock pot? Just clean them, wrap in foil, pile in your crock pot, DON’T add water, cook on low for 10 hours, or high for 6 hours. Then all you do is heat up some chili, add cheese and sour cream and you have a great easy meal! Wednesday – Lasagna Soup from A Farm Girls Dabbles. I saw this on Pinterest and have wanted to make it for a while. It seems perfect for this week. Freak the family out a little! 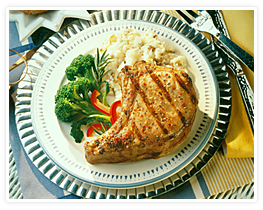 Thursday – Honey Glazed Pork Chops – From $5 Dinners. Randalls had the pork chops on sale this week until Tuesday and I grabbed some and tossed them in the freezer. I am pulling them out Wednesday night and unthawing. This is a great under $5 dinner! Serve with the brown rice cheap at Walmart! Friday – Spaghetti and Meatballs – This is another SUPER fast and SUPER cheap dinner! I can throw this together fast! Plus, it is about $7 for the entire meal for my family! Hi Rose! The meatballs I am using are the Armour meatballs and they are pre made in a bag. That is why I am making that, we have a lot going on and I thought it would be a easy dinner! I dont really have a set meatball recipe, just google it if you want to make it homemade. Sorry for any confusion! 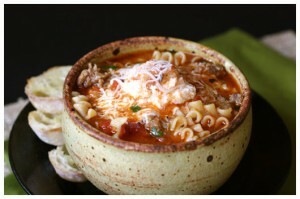 I made the Lasagna Soup last night and it is AMAZING! Thanks Tiffany! We had it also!!! It was WONDERFUL!!! I made the crock pot chicken soft tacos and wow simple and delish! Thank You!